When I'm struggling to keep moving on a project or not finding my creative flow, I like to listen to creators that get my blood moving. This particular audiobook has been in my library for about fifteen years now, and it still never fails to get me going again. (And thanks to the magic of Audible.com, it's never more than a couple taps away on my iPhone.) In this 90-minute interview, she talks with her longtime friend, literature professor Michael Riley, about her influences, her passions, her writing process... you've had conversations like this before, I'm sure, where the thread seems to have a mind of its own and wander all over, dragging the two of you with it. Whether I'm in the car or walking through the grocery store, or just doing the dishes, following this conversation in the background has a way of lighting up the magic neurons in my brain and getting me back to the writing chair. My favorite part of the whole interview is where she talks about obsession, finding herself at 2am in the bathroom with old books and documents all around her, trying to figure something out. 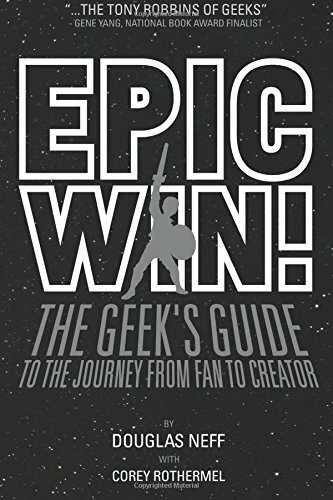 And THAT, if you've read Epic Win!, is exactly what I mean by Bliss. It's the Universe's way of guiding you to your next creative project. And it's so important to develop your own trust for that creative instinct. Anne and Michael's conversation is both a reminder and a gentle nudge in that direction. You don't have to be an Anne Rice fan to benefit, by the way. She's an author, plain and simple, and she's learned how to bring forth her own creative Bliss over and over and over again. That's wisdom that we can all use, whether we're into vampires or ponies or superheroes or plain old folk. Anne Rice gets some things about working creatively, and she gets them well enough to speak eloquently and simply about them. And those messages are universal. At less than ten bucks on Audible, this is a no-brainer. Get yourself a copy and put it in your "in case of creative emergency" kit. More importantly than this particular audiobook, though, is the idea of "Creative Jumpstarts," in the first place. I suspect we all have our go-to playlists and movies and books and other things we rely on whenever we get stuck. What are yours? Why do they work for you? I'd love to hear about them in the comments.